This tutorial discusses logical data extraction, and one of its subtopics Android SIM card extractions. This article is taken from the book Learning Android Forensics by Oleg Skulkin, Donnie Tindall, and Rohit Tamma. This book explore open source and commercial forensic tools and teaches readers the basic skills of Android malware identification and analysis. In digital forensics, the term logical extraction is typically used to refer to extractions that don’t recover deleted data or do not include a full bit-by-bit copy of the evidence. However, a more correct definition of logical extraction is any method that requires communication with the base operating system. Because of this interaction with the operating system, a forensic examiner cannot be sure that they have recovered all of the data possible; the operating system is choosing which data it allows the examiner to access. In traditional computer forensics, logical extraction is analogous to copying and pasting a folder in order to extract data from a system; this process will only copy files that the user can access and see. If any hidden or deleted files are present in the folder being copied, they won’t be in the pasted version of the folder. As you’ll see, however, the line between logical and physical extractions in mobile forensics is somewhat blurrier than in traditional computer forensics. For example, deleted data can routinely be recovered from logical extractions on mobile devices due to the prevalence of SQLite databases being used to store data. Furthermore, almost every mobile extraction will require some form of interaction with the operating Android OS; there’s no simple equivalent to pulling a hard drive and imaging it without booting the drive. What data can be recovered logically? The bulk of this data is stored in SQLite databases, so it’s even possible to recover large amounts of deleted data through a logical extraction. When forensically analyzing an Android device, the limiting factor is often not the type of data being sought, but rather whether or not the examiner has the ability to access the data. All of the data listed previously, when stored on the internal flash memory, is protected and requires root access to read. The exception to this is application data that is stored on the SD card, which will be discussed later in this book. Without root access, a forensic examiner cannot simply copy information from the /data partition. The examiner will have to find some method of escalating privileges in order to gain access to the contacts, call logs, SMS/MMS, and application data. These methods often carry many risks, such as the potential to destroy or brick the device (making it unable to boot), and may alter data on the device in order to gain permanence. The methods commonly vary from device to device, and there is no universal, one-click method to gain root access to every device. Commercial mobile forensic tools such as Oxygen Forensic Detective and Cellebrite UFED have built-in capabilities to temporarily and safely root many devices but do not cover the wide range of all Android devices. The decision to root a device should be in accordance with your local operating procedures and court opinions in your jurisdiction. The legal acceptance of evidence obtained by rooting varies by jurisdiction. With the rise in capacity of device storage, SD cards, and cloud backups, the necessity for storing data on a SIM card has decreased. As such, most modern smartphones typically do not store much, if any, user data on the SIM card. All network data listed previously does still reside on the SIM, as a SIM is necessary to connect to all modern (4G) cellular networks. As with all Android devices, though, there is no concrete stipulation that user data can’t be stored on a SIM; it simply doesn’t happen by default. Individual device manufacturers can easily decide to write user data to the SIM, and individual users can download applications to provide that functionality. This means that a device’s SIM card should always be examined during a forensic examination. It is a very quick process, and should never be overlooked. The SIM card should always be removed from the device and examined separately. While some tools claim to read the SIM card through the device interface, this may not recover deleted data or all data on the SIM; the only way for an examiner to be certain all data was acquired is to read the SIM through a standalone SIM card reader with a tool that has been tested and verified. The location of the SIM will vary by device but is typically either stored beneath the battery or in a tray located on the side of the device. Once the SIM is removed, it should be placed in a SIM card reader. There are hundreds of SIM card readers available in the marketplace, and all major mobile forensics tools come with an included reader that will work with their software. Oftentimes, the forensic tools will also support third-party SIM readers as well. There is a surprising lack of thorough, free SIM card reading software available. Any software used should always be tested and validated on a SIM card that has been populated with known data prior to being used in an actual forensic investigation. Also, keep in mind that much of the free software available works for older 2G/3G SIMs, but may not work properly on a modern 4G SIM. We used the Mobiledit! Lite, a free version of Mobiledit!, for the following screenshots. It is available at: http://www.mobiledit.com/downloads. Due to the fact that SIM cards conform to established, international standards, all SIM cards provide the same security functionality: a 4- to 8-digit PIN. Generally, this PIN must be set through a menu on the device. On Android devices, this setting is found at Settings | Security | Set up SIM card lock. The SIM PIN is completely independent of any lock screen security settings and only has to be entered when the device boots. The SIM PIN only protects user data on the SIM; all network information is still recoverable even if the SIM is PIN locked. The SIM card will allow three attempts to enter the PIN; if one of these attempts are correct, the counter will reset. On the other hand, if all of these attempts are incorrect, the SIM will enter Personal Unblocking Key (PUK) mode. The PUK is an 8-digit number assigned by the carrier and is frequently found on documentation when the SIM is purchased. Bypassing a PUK is not possible with any commercial forensic software; because of this, an examiner should never attempt to enter the PIN on the device as the device will not indicate how many attempts remain before the PUK is activated. An examiner could unwittingly PUK lock the SIM and be unable to access the device. Forensic tools, however, will show how many attempts remain before the PUK is activated, as seen in the previous screenshots. Common carrier defaults for SIM PINs are 0000 and 1234. If three tries remain before activating the PUK, an examiner may successfully unlock the SIM with one of these defaults. Carriers frequently retain PUK keys when a SIM is issued. These may be available through a subpoena or warrant issued to the carrier. 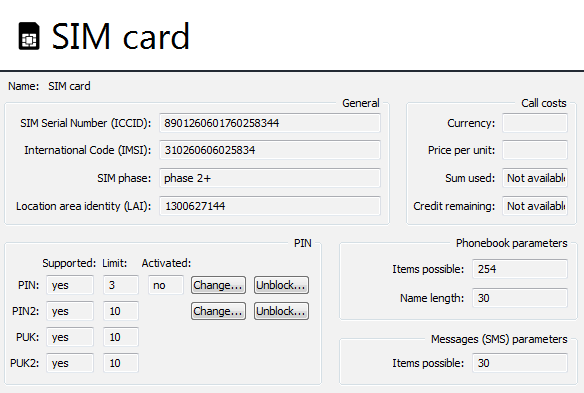 The SIM PIN itself provides almost no additional security, and can easily be bypassed through SIM cloning. SIM cloning is a feature provided in almost all commercial mobile forensic software, although the term cloning is somewhat misleading. SIM cloning, in the case of mobile forensics, is the process of copying the network data from a locked SIM onto a forensically sterile SIM that does not have the PIN activated. The phone will identify the cloned SIM based on this network data (typically the ICCID and IMSI) and think that it is the same SIM that was inserted previously, but this time there will be no SIM PIN. This cloned SIM will also be unable to access the cellular network, which makes it an effective solution similar to Airplane Mode. Therefore, SIM cloning will allow an examiner to access the device, but the user data on the original SIM is still inaccessible as it remains protected by the PIN. We are unaware of any free software that performs forensic SIM cloning. It is supported by almost all commercial mobile forensic kits, however. These kits will typically include a SIM card reader, software to perform the clone, as well as multiple blank SIM cards for the cloning process. This article has covered SIM card extraction, which is a subtopic of logical extractions of Android devices. To know more about the other methods of logical extractions in Android devices, read our book Learning Android Forensics.